Two people died in Northern California of causes related an extreme heat wave scorching the Southwest U.S., authorities said Wednesday. 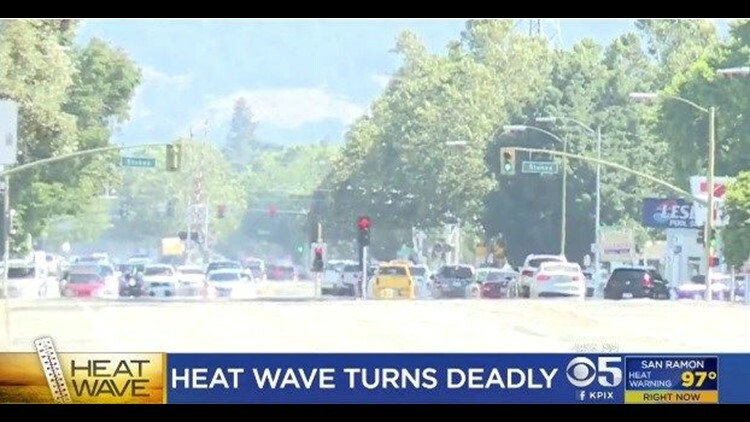 SAN FRANCISCO (AP) — Two people died in Northern California of causes related an extreme heat wave scorching the Southwest U.S., authorities said Wednesday. A 72-year-old man and an 87-year-old woman died in San Jose Monday, when temperatures reached 94 degrees. One of them was homeless and lived in a car, Santa Clara County said in a statement. County spokeswoman Marina Hinestrosa said she couldn't provide any other information on the people who died due to health privacy laws. A National Weather Service heat advisory is in effect until Thursday at 9 p.m.
Santa Clara County is forecast to get high temperatures ranging from 90 to 100 degrees on Thursday. Throughout the San Francisco Bay Area, high temperatures are expected to range between 90 and 105 degrees across most inland areas with locally hotter temperatures possible. Overnight cooling will provide some relief but nighttime lows are forecast only to drop into the upper 50s and 60s for most inland areas. For communities in the thermal belt at higher elevations, expect warmer overnight lows in the lower to mid-70s. Residents were advised to avoid heavy activity in the heat and not leave children or pets in vehicles.